What a thrill. The kids and I were doing a thrift store tour yesterday. 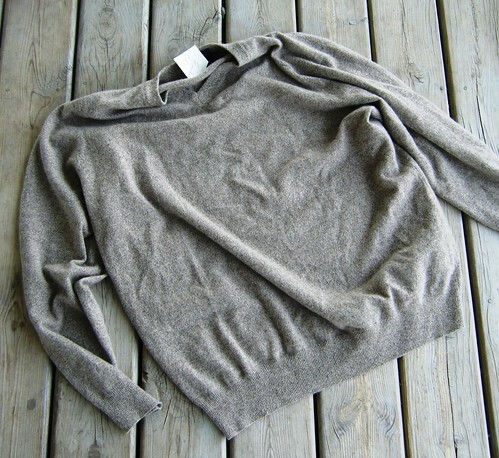 (I do so every two weeks) I found this: An absolutely exquisite 100% cashmere sweater, men's large, with a couple of small tears around the neckline. Why am I so thrilled about a damaged thrift store purchase, you ask? 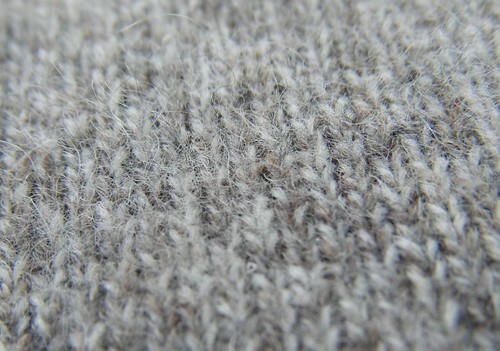 Ahhh, this gorgeous thing will be transformed back into a few thousand yards of delicate cobweb weight cashmere yarn. Enough for a couple of large shawls and some scarves besides. I'm thrilled at the possibilities. I love the color and its depth as well... And it only cost me $1.99! Jess' Dad's family had a bridal shower for her last week. This is one of the "party props". I thought it was so cute. 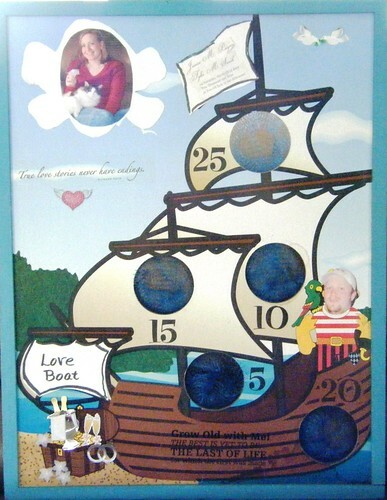 The "Love Boat / Pirate Ship". See Tyler as the pirate of Jess' heart? She's floating in the clouds. Yep, they nailed it. :) And last, I've had Tom scouring the farm up north for old galvanized buckets and things. Especially those with leaks. They make great little planters. The watering can at the bottom was my Grandfather's. 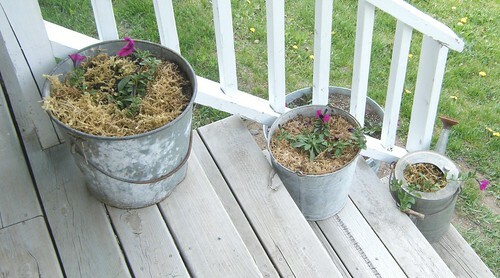 I planted with "Wave Petunias" - again. I'm just smitten with those particular plants. I was never fond of petunias until I happened to get some of these. Oh my! They are so carefree and profuse, no deadheading required, they spread to massive mounds of blooms. I love them to distraction. I'll take another picture later this spring / summer when they've filled out.